photonic systems to biological research. 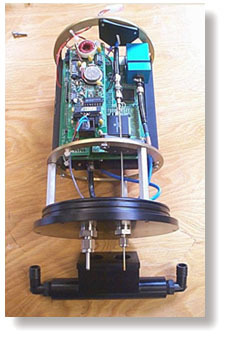 Researchers from the Institute of Marine and Coastal Sciences at Rutgers University in New Brunswick, N.J., have integrated the Ocean Optics fiber optic oxygen sensor into the system shown here. This sensor is a low-power, self-contained system for monitoring dissolved oxygen in marine and freshwater ecosystems. In 1997, researchers at Rutgers University conducted a test of the FOXY Sensor at the Great Bay-Mullica River in New Jersey. The sensor offered several advantages compared to electrodes: faster response time, better stability, and immunity to changes from exposure to sulfide. In addition, the sensor did not consume oxygen and was easier to maintain than electrodes. The Rutgers researchers also noted the sensor's operation in saltwater, which can adversely affect electrodes. In an article in the March 1999 issue of Sea Technology, they wrote: "This salinity independence allows fiber optic oxygen sensors to be applied easily when monitoring natural waters that show variations in salinity, such as estuarine waters." Also, the researchers were able to deploy the FOXY Sensor for long periods of time to collect data, and observed that oxygen concentration in the estuary declined by nearly 80 percent overnight -- a significant change that might indicate major tidal fluctuations. With oxygen electrodes, researchers would have had a more difficult time collecting such data. For more information, contact Professor Clare Reimers, Institute of Marine and Coastal Sciences, Rutgers University, 71 Dudley Road, New Brunswick, N.J. Her e-mail is reimers@ahab.Rutgers.edu. Wang, W.; Reimers, C.E. ; Wainright, S.C.; Shahriari. M.R. ; Morris, M.J. Applying Fiber-Optic Sensors for Monitoring Dissolved Oxygen. Sea Technology, March 1999, Vol. 40, No. 3, pp. 69-74. Shahriari, M.R. ; Murtaugh, M.T. ; Kwon, H.C. Ormosil Thin Films for Chemical Sensing Platforms. Chemical, Biochemical and Environmental Fiber Sensors IX, 1997, SPIE, Vol. 3105, pp. 40-51. Krihak, M.; Shahriari, M.R. A Highly Sensitive, All Solid State Fiber Optic Oxygen Sensor Based on the Sol-gel Coating Technique. Electronic Letters, 1996, Vol. 32, No. 3. Krihak, M.; Murtaugh, M.T. ; Shahriari, M.R. Fiber Optic Oxygen Sensors Based on the Sol-Gel Coating Technique. Chemical, Biochemical and Environmental Fiber Sensors VIII, 1996, SPIE, Vol. 2836. Allen, C.B. ; Schneider, B.K. ; White, C.J. Limitations to oxygen diffusion in invitro cell exposure systems in hyperoxia and hypoxia. American Journal of Physiology Lung Cell Molecular Physiology, 281: L1021-L1027, 2001. ©2007 Ocean Optics, Inc. All rights reserved. For more infromation on how what sytem or components best fit your needs, contact High Desert at 520-456-9095. Or click on the link below.